01/04/01 - Model SCL updated to handle compressed data sets and any data source that does not deliver an absolute row number. Prior to this update, the model scl would go into an infinite loop for data sources that did not provide an absolute row number. Only Version 8 model scl has been updated. The Version 6.12 Model SCL will go into an infinite loop if used with a compressed data set. What is green bar model scl? The green bar model is a piece of compiled SCL code that is attached to a data table object, and is thus called by the data table model / viewer class. A picture is worth a thousand words. For now that doesn't matter, feel free to use greenbar to make your life easier. 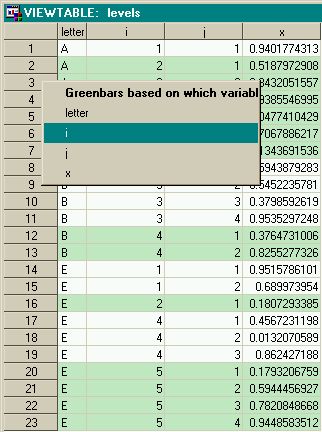 Greenbar is not recommended for data sets with > 75,000 rows or more than several thousand expected 'bands'. The bands may be incorrect if a where clause is active. This model scl is designed to be installed as common.model.greenbar.scl. However, greenbar should work regardless of catalog or catalog entryname it is stored in. If you want to experiment with greenbar first, try installing to the WORK library. SAS Users: How do I use greenbar with viewtable ? Now, I am only one keystroke away from using greenbar. SAS/AF Programmers: How do I use greenbar with the Data Table class ? After the greenbar SCL is installed in a catalog, you can attach the SCL entry to a data table object. In a frame, make a data table object, and in the object properties enter COMMON.MODEL.GREENBAR in the SCL Entry: field. You can attach the model scl at run-time using the _setSource method. How can I do row level trafic lighting in V8 Table viewer? Is it via the ModelSCL associated with the attached Data Set Model? I've just picked up AF again after about 5 years and all that DFINIT stuff is way in the past. In build drop in a table viewer, a sas data set model on the viewer.